Today it is our pleasure to announce the two newest products in our collection of winter cycling softgoods: Cobrafist pogies and Bergraven gaiters. Designed for winter fatbiking, both products are centered around our mission to deliver unparalleled comfort and control in the areas of hands, feet and traction. Cobrafist pogies are our first product that address hand comfort, while Bergraven gaiters assist the Wölvhammer in keeping feet comfortable while fatbiking in deep snow and extreme cold. Before the Cobrafist, a common issue with pogies was that they were too warm and humid inside. As many know, the key to staying comfortable in the winter is not just about staying warm. It's about regulating temperature and moisture at a perfect balance that will allow you to stay on your fatbike all day long. 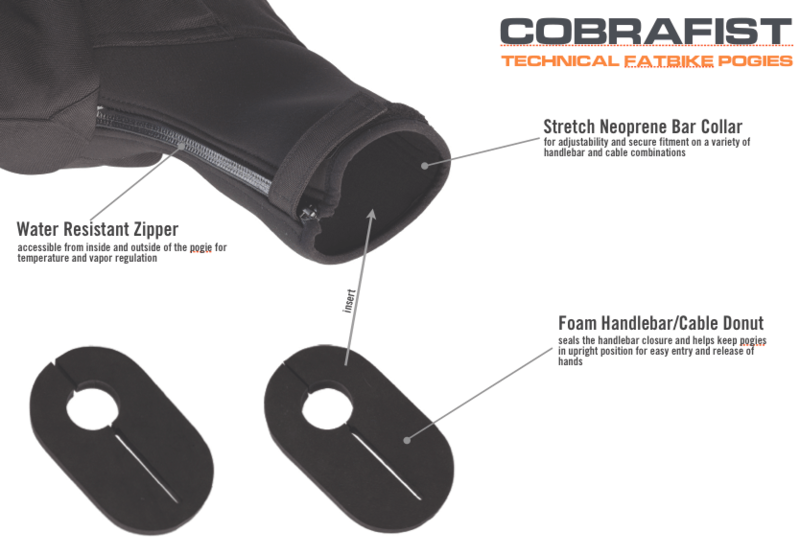 The Cobrafist has zippered vents on the top and bottom, concealed under a panel to act as an air duct while also offering protection from falling snow. Each vent has zipper pulls on the inside and outside so they can be adjusted while riding or off the bike. We also designed a handlebar closure system that creates volume inside the pogie, while also providing a secure fit around the brake and shift cables. A stretch neoprene with a zipper and velcro fastener is fitted around an oval-shaped foam donut. 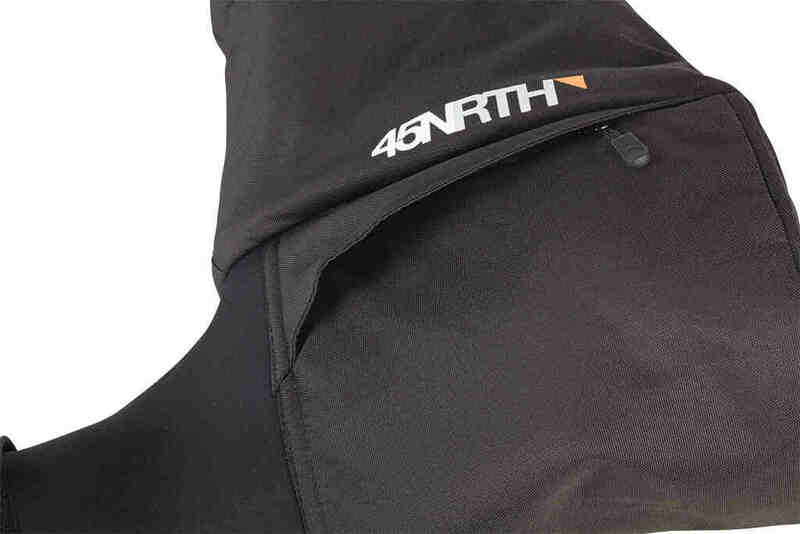 Not only does this create volume and secure fit, it seals the pogie from unwanted moisture and cold air, leaving modulation to the area of the pogie where you want it - the zippered vents. On the other end of the attachement system is a bar-end plug that secures a grommet against the handlebar. This allows you to set the angle of the pogie and tighten the hex bolt of the plug where you want it. When in place, the pogie will not twist forward and want to fall off the front of the bar. The shell of the Cobrafist is a puncture resistant 600 denier poly, and insulation is provided with 400g Primaloft ECO between the shell and inner lining material. In addition to providing thermal insulation, the Primaloft ECO is water resistant and made of post consumer recycled materials. At the cuff end of the Cobrafist there is a drawstring to adjust the fit around your arm, or close it completely when off the bike in blizzard conditions. Cobrafist will be shipping to dealers the first week of November. $125 MSRP. Designed specifically around the Wölvhammer, the Bergraven fatbiking gaiters deliver knee high protection while riding in deep snow. Keeping blood warm between your core body and feet is essential to keeping your toes warm. With 100g Primaloft ECO insulation, Bergraven is the first cycling specific gaiter that insulations in addition to keeping snow out of the ankle pipe of your boots. Attaching the gaiter is simple. There is a hook that clips into the ring on top of the Wölvhammer. A ladder lock buckle is located on the lateral side to permanently adjust the saddle strap. A hook and loop closure runs along the lateral side from the bottom all the way to the top for easy access. On the medial side there is a panel reinforced with stretch aramid to provide abrasion resistance against crank arm contact. 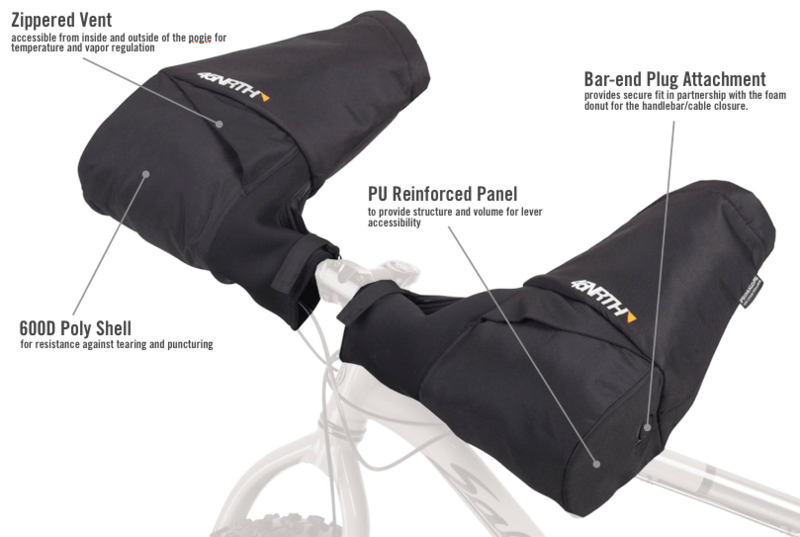 With Q factor commonly being very tight on fatbikes, the Bergraven is the only gaiter designed specifically to address this. 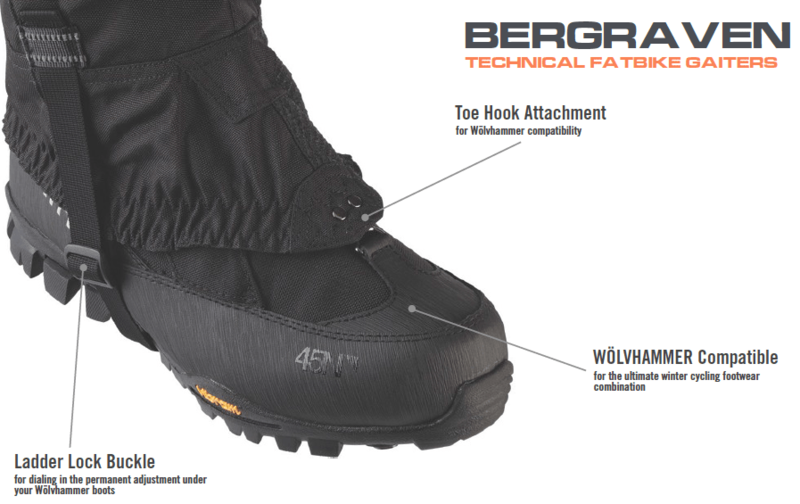 Bergraven gaiters will be available in two sizes. The medium size will fit Wölvhammer sizes 38-43, and the large size will fit 44-50. These will also be shipping to dealers the first week of November. $85 MSRP.